If you’re like me, you’ve experimented a lot trying to make the perfect roast chicken. There are all kinds of recipes, but really all I want to do is get a crispy, juicy chicken out of the oven. I really don’t care about a bunch of different flavors and seasoning; I can figure that out. What had me baffled was how to get the skin crispy and pretty without drying out the chicken inside. Well, I believe I’ve perfected a recipe. This is about as simple as it gets and has resulted in a perfect roasted chicken every time. Of course, your oven will vary, as well as the size of the bird. So, tweak the recipe a bit if you need. My family has never complained about any of my trial runs, but when I got it perfect, they really tasted the difference. Remove the giblets, etc., from the inside of the chicken. Thoroughly wash the chicken with fresh cold water, inside and out. Drain the water from the inside of the chicken and set the chicken on a paper towel covered rack. Take clean paper towels and COMPLETELY DRY the skin. This step is very important – the drier the skin, the crispier the skin is and the prettier the color. Let the chicken sit on the rack for at least 1 hour or until it reaches room temperature. This will do two things: it will allow the chicken to dry more thoroughly and it will prevent the chicken from getting tough, which happens when cold meat is put in a hot oven. Put the oven rack up to the second from the highest position, so the chicken is roasting in the upper third of the oven. Season the chicken on the inside with salt and pepper. You can include other seasonings or herbs on the inside if you wish, but at the very least you need salt and pepper. Be generous. Now truss the bird with butcher’s twine, or at least tie the legs together at the ends so they stay close to the body of the bird. You can also tie the wings together behind the back or just tuck them in so they stay behind and underneath the chicken when in the pan. Flip the chicken so the back is facing you and generously salt and pepper the skin making sure you get it seasoning all over. Turn the chicken over and generously season the front, again making sure you cover all the skin. I hold the seasonings up high and let it fall like rain over the chicken. It produces a nice, even result that looks pretty. Finish your seasoning with any herbs you were using. Place the prepared chicken, breast up, in a heavy roasting pan or cast iron pan. I use my cast iron pan because it’s the perfect size and it has a handle which makes it easier to check on and remove. When the oven is preheated (not before!) put the chicken in with legs facing back and neck facing front. This keeps the most delicate area, the white meat, forward in the oven, presumably less hot than the back of the oven. The dark meat can stand the higher heat. Close the oven and let the chicken cook for about 1 hour to 1 1/4 hour. This time will vary depending on the size of the chicken and how accurate your temperature is. When chicken is golden brown and legs can be loosened when tugged on, the chicken is done. Remove the chicken from the oven and let sit for 10 to 15 minutes before cutting. This allows the juices to return to the meat instead of bubbling under the skin, keeping the meat moist. Cut up and serve as desired. You’ll notice I don’t add any oil or butter to my recipe. I found that both either keep the skin too moist (not crispy) or it will burn. The chicken has enough fat all by itself. Be sure you dry the skin well and you let the chicken come to room temperature before you put it in the oven. 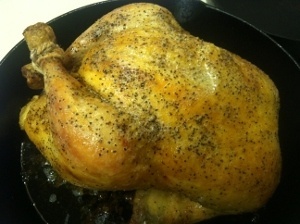 I also find a cast iron skillet works perfectly fine for this size chicken. I like having a handle to easily move the chicken in and out of the oven. I hope you’ll give this a try. Remember, the cooking time may vary, so watch your oven the first time to keep an eye on it. Now that I have this recipe down, I never fret about having my roast chicken come out crispy and juicy every time. We all want to get the most out of our money, right? And we all love to get meals on the table with the least amount of effort and time spent in the kitchen. But wouldn’t you also love to get out of the kitchen fast AND with a few extra meals in the fridge and freezer? Squeezing the most out of every cent you spend on groceries is what Cook Once Eat Twice is all about. Now you can learn how to cook in ways that not only put dinner on the table economically, but with plenty to spare! And, we’re not just talking leftovers here… we’re talking about planning meals with NEW CREATIVE meals to come. 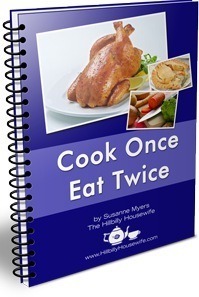 In this ebook, you’ll learn about the strategies needed to get two, three, or MORE meals out of one cooking session. PLUS you’ll get over 300 recipes to help you prepare a delicious plan of attack! Click on and buy Cook Once Eat Twice today to start getting the most out of every meal!